Chinese crested dog breed is the combination gentle lap dog, sensitive companion and playful pixie. This dog breed is slender and fine boned, among the graceful and most elegant dog breeds. Slightly it is longer than tail. This Chinese crested dog bread is an exotic looking small dog that doesn’t actually hail from the china. This dog bread can be found in two types: one is hairless, another type has silk hair on tail, feet, and crest; and also genetically recessive powder-puff. 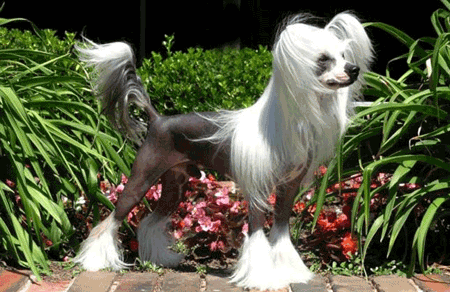 Average height of the Chinese Crested is in between 11 to 13 inches for both male and female. Usually they weigh up to 12 pounds. Usually Chinese crested are healthy. However like all pets, they are prone to some health problems. Not all Cresteds get same problems, it is necessary to be aware of all those illness symptoms of Cresteds if you want this bread as your pet. Chinese crested dog breed is happy and alert; it adores playing on its owner. Except irritating it with lots of kisses and it wants to spend much snuggle time in its owner’s. This breed doesn’t accept strangers very easily, however once it comes to love you and made bond with you, you become its world. Creasteds need ¼ to 1 cup of high quality dry food per day. Divide this into two meals. Depending on your adult dog’s size, activity level, metabolism, and age, the amount of food that dogs eat will vary. Like people, dogs are also individuals, so they don’t all need same amount of feeding. To keep yourChinese Crested dog breed in good shape, measure his food while feeding rather than feeding blindly. This dog needs minimal exercise-It is not good in jogging-but stimulating this dog mentally is important. You can use many puzzles and toys, which are specifically designed for dogs in the market. Gentle, sweet children are very much adored by Chinese Crested Dog Breed. Children must be careful with this dog, they need to be enough older to understand.